Margaret Reagan introduced me to Archibald Rutledge and lent me this book. It’s the second of his books that I’ve read. Rutledge was poet laureate of South Carolina for forty years. During his long life, he published nearly 50 books, mostly on outdoor life and poetry and wrote for a number of outdoor magazines including Field and Stream. Born in 1883 in McClellanville, SC, Rutledge grew up on Hampton Plantation. His ancestors include a long list of South Carolina royalty including a signer of the Declaration of Independence. As a child, his father, “the Colonel,” took him hunting and fishing. He attended high school in Charleston and later Union College in Schenectady, New York. Upon graduation, he taught English at Mercersburg Academy in Pennsylvania. While there, he made regular trips back to Hampton, especially during the Christmas break. In the 1930s, he moved back and devoted his life to the plantation and writing. 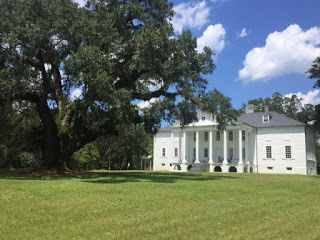 He lived out his life at the plantation, except for the summer months when he headed to the beach or the North Carolina Mountains. Shortly before his death, he sold the plantation to the state of South Carolina. Today it is maintained as a park. Peace in the Heart was first published in 1927. At the time, Rutledge was still teaching in Pennsylvania. There were a number of editions, the last published in 1947. Sadly it is out of print and hard to obtain. I was able to find copies of this book for sale (but with hefty price tags). 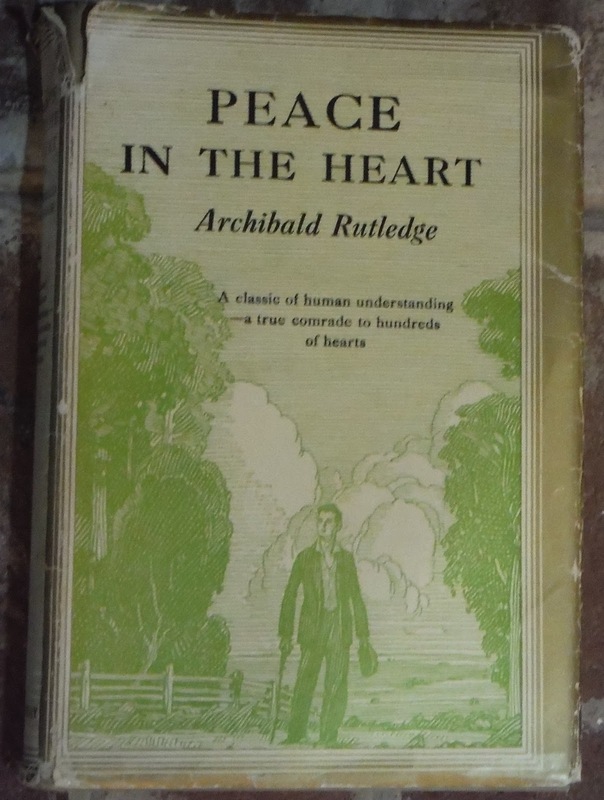 There are a number of Rutledge’s other books that are still in print. Drawing from his keen observations of nature, Rutledge explores life. An example of his observations is seen in the interest he took in a mud-dauber” (a type of wasp) who built his dirt home on one of the beams of Rutledge’s porch. He kept knocking the dirt cave off his beams, but the wasp kept rebuilding it. Each load of sand that the wasp mined near the creek took him four minutes to obtain and with each rebuilding, the sand home took on a redder hue as the wasp increased the portion of clay, hoping to build a stronger home that would last (279-80). Rutledge professes his Christian faith, but at times I wondered if his faith is more influenced by the natural world than the Word or Bible. “Face to face with Nature, we are face to face with God; and I for one believe Him to be the God of love as well as the God of law. That I cannot see Him troubles me not. I find him in His works, in His constant abundant blessings, in the nature of the human soul” (76). He thanks his Creator for supplying necessities and extras. Sunlight, air, water, food and shelter are necessities. Moonlight and starlight along with music, perfumes, flowers and the wind crooning through pines are extras to be enjoyed (15). He tells a friend who was dying, but miraculously recovered after hearing a bird sing. God “does not love us with words: He loves us by giving us everything we need in every way,” Rutledge notes. (16). While acknowledging his own sentimentalism and how nature writers are criticized for being sentimental, he wonders why it’s seen as a bad thing (68). Toward the end of the book, he reports on how a German scientist came to the conclusion that wild things cannot reason. Rutledge then sarcastically quipped, “Well, they get along remarkably in a world in which reasoning men have a pretty hard struggle to succeed” (283). He finds the natural world so intriguing and peaceful, suggesting that nature plans for life and not death (243). Obviously he overlooks the life and death struggle animals have in the wild. Although a hunter, he doesn’t glorify the killing of animals and in one story in which he went duck hunting but left his gun on a tree by the launch, he muses how he was glad for often a man who takes a gun “eaves his heart at home” (110). He finds that by observing natural laws we can keep out of trouble, drawing on how animals know on instinct how to act (51) and that the natural world knows to obey such universal laws and not to attempt to make a bargain with the Almighty (56). While he has obviously learned much from scientists, he suggests that there are other types of questions that the scientists don’t ask. “What does this mean in terms of the spirit? What does all this beauty and intelligence suggest to the heart? What can I learn from my own soul by surveying in thoughtful love the sounds of God’s wild children” (253-4). Moving through the day, he explores storms and issues that arises with high water levels. He finds his heart rises during storms, which is why he sees them as a blessing (78), while also providing us an opportunity to shelter others. Caring for others during their storms helps us “develop our sympathies” (86). After the storm passes, he notices how we can rejoice that we have survived and find peace (90). High water, especially where fresh water pushes into salt water, creates unique situations. He tells about a beach in South Carolina in which bathers were horrified to see a large alligator, washed out to sea in high water, delighting in riding waves in the surf (107). Interestingly, he does not include a chapter on drought and the unique ways low water levels open up new opportunities to explore. A couple of chapters were devoted to two individuals who were influential in his life. Prince was an African American boy with whom he grew up. His family had live on the plantation as slaves. After emancipation, both of his parents worked at the plantation. His mother was the cook for 40 years and his father brought in the firewood and on the cool mornings would build fires in the hearths throughout the home. In Rutledge’s book, God’s Children, there are more stories about Prince. As for the slave who had saved his life, Rutledge tells his father’s story of a government agent visiting African-Americans that may have fought in the Civil War to determine their eligibility for a pension. This former slave told the agent (who was working on commission) that he was in the war all four years, omitting which side he had served during the war. To Rutledge’s father’s delight, he was granted a pension. After his wife died, he married a younger woman and at the time of the writing of this book, she was still receiving his pension (218-219). Rutledge seems, however, to be most at home alone in the woods. He has a chapter on solitude and another on worship in the wild. He talks joy and delight in the world and the animals within it. He seems much more interested in the animal kingdom than plants, only mentioning flowers and trees in passing. But with his intimate knowledge of wildlife, he believes that God delights in the world and it’s just another example of God’s love for us. Although he doesn’t dwell on sin, Rutledge believes it’s only the human race that’s able to live “in opposition to his physical instincts” and to act as if he’s immortal (161). He does appears to have a concept of the incarnation, suggesting that the knowledge of God’s presence and love should be comforting as it means our foes are already defeated (177). Like his book, God’s Children, there are paternalistic views that are considered politically incorrect in today’s world. This comes out mostly when he talks about his father’s friendship with his former slaves. Writing decades before the Civil Rights movement, Rutledge learned from his father that “while equality is often impossible, brotherhood never is” (210-211). He appears to accept unquestionably that equality is impossible, but his views were probably more enlightened than most during the 1920s. I recommend this book (if you can find a copy) for I found Rutledge to be a keen observer of nature. I especially like the analogy he made between water lilies and human beings. Lilies appear to be floating on the surface, but what we don’t see is that they are tethered to the earth. We, too, need to be so anchored. Reading your review makes me feel I know the book, and being a student of the Civil War I will look for more info on the young colonel Rutledge.